Sanitary applications in pharma, life sciences, biotechnology, cosmetics, and the food and beverage industry are highly regulated and have very strict requirements. The equipment and instrumentation used in any sanitary application must be made of materials that are not toxic. Also, to ensure purity, equipment and instrumentation must be repeatedly and thoroughly cleaned and/or sterilized, and must avoid corrosion and any other source of contamination. Corrosion can be produced by the process media itself. It is more often caused by the products used for cleaning and sterilization, even though reliable and effective cleaning is vital in sanitary applications. Common clean-in-place (CIP) systems use highly corrosive alkali and acid-based solutions. Steam/sterilize-in-place (SIP) processes expose wetted parts to high-temperature and/or high-pressure cycles, and autoclaving can expose the measuring instruments’ internal components to moisture. Corrosion affects the quality of your product: Corroded parts lead to leaks and will contaminate your media. In addition, corrosion in measuring instrumentation affects accuracy and repeatability. The losses associated with the need to discard contaminated batches and to stop the process to replace damaged instrumentation can be considerable. What Is Austenitic 316L Stainless Steel? Austenitic 316L stainless steel is highly recommended for the vast majority of sanitary applications. A low-carbon stainless steel, Austenitic 316L is inert to the majority of media found in sanitary applications and is highly resistant to acids. It has good resistance to the attack of organic products and withstands the attack of bases, including sodium hydroxide solutions – a common cleaning agent in CIP processes. In some cases, however, stronger nickel-based alloys such as Hastelloy® are necessary. 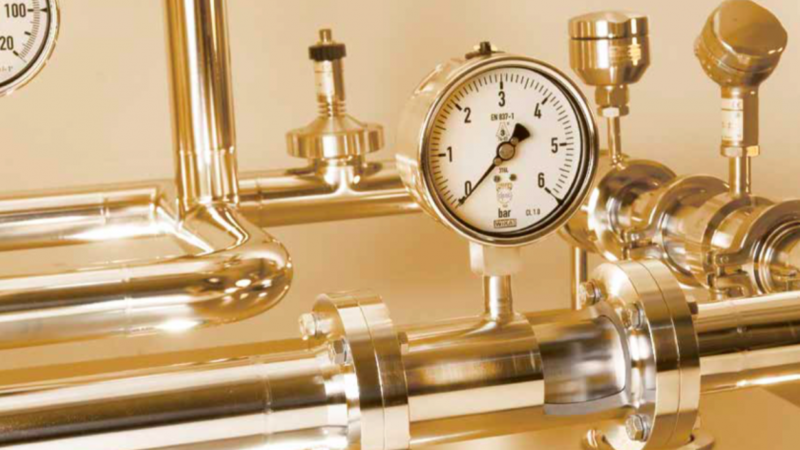 Certain materials – such as brass and brass alloys used by some other manufacturers of measuring instrumentation – are not the best choices for sanitary applications. These materials are appropriate for many other applications, but have very low resistance to corrosion. They also deteriorate easily in the presence of moisture, organic compounds, acids, and bases. Brass parts may compromise the integrity of the final product. Measuring instrumentation for sanitary applications must work under tough conditions while providing accurate measurements and repeatability. This instrumentation must be carefully and properly designed to perform well. The selection of the material used for the wetted parts and potentially exposed non-wetted components of sanitary gauges is critical. These parts are in direct contact with process and/or cleaning media, which may cause corrosion. WIKA uses Austenitic 316L stainless steel as the standard material for all the wetted and non-wetted metallic components of its gauges. WIKA offers a complete line of mechanical and electronic pressure gauges, pressure transmitters, switches, and diaphragm seals that withstand the demanding requirements of sanitary applications. The sanitary pressure gauge, model type M93x.3A, for example, is ideal for measuring pressure in food and beverage, biotechnology, and pharmaceutical processes. The all-welded construction of this assembly complies with 3-A Sanitary Standards. All wetted parts are made of electro-polished 316L stainless steel and will not corrode, even after repeated CIP and SIP cycles. The internal metallic components are also constructed from 316L stainless steel to assist in avoiding corrosion due to cleaning methods. Model type M93x.3A works well for a wide range of pressures and resists high temperatures. 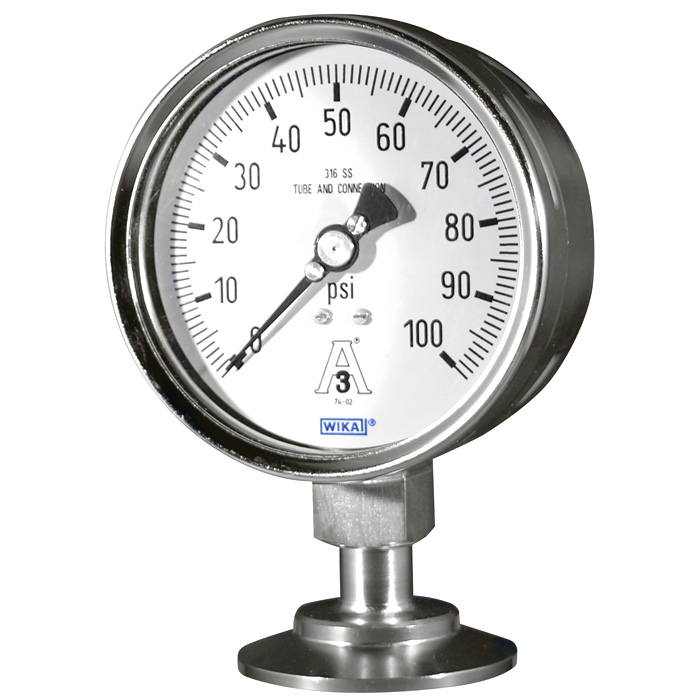 WIKA’s all-stainless steel gauges can endure harsh environments. They will not compromise your process and will provide repeatable, accurate data. Contact WIKA’s experts today to get more information about how WIKA’s stainless steel, corrosion-resistant gauges can benefit your sanitary application.